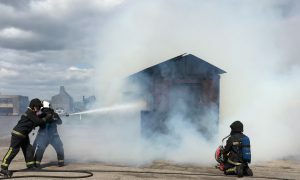 The Angus Hi-Combat Portable Foam Uniductor, when matched with Angus Hi-Combat Foam branchpipes or nozzles, provides the simplest possible means of getting foam to the fire where it is needed. They can be placed near a portable pump or hydrant outlet, minimising manpower requirements and leaving the firefighter to concentrate on effective application of the foam to control the fire situation. Angus Hi-Combat Portable Foam Uniductors are venturi-type inductor devices, designed for use with the full Angus Fire range of Hi-Combat branchpipes and nozzles for quick and reliable response to first aid fire attack duties. There are five models matched for use with aspirating foam branchpipes flowing 225, 450 and 900L/min at 7 bar g (100psi). These Uniductors typically experience a 35-40% pressure drop across the inductor and operate within a recommended pressure range of 5-10 bar g.